Martinez the gopher has an extensive gold mining operation, but he needs an expert to help him excavate an incredibly rich vein of gold. Click here to play! That's where you come in, with your human tools and mining methods. You and Martinez could become the richest human/gopher partnership in history, even bigger than Alexander the Great and his famous pet gopher. In order to get that gold above ground, you'll need to line up explosions, get the mine carts rolling, and make sure the place is well-lit with lanterns. Martinez the gopher will help you with everything, and he's a natural gold miner thanks to his years of digging tunnels as a gopher. He also had a mole girlfriend once who showed him some special digging methods, but he doesn't like to talk about that time in his life. 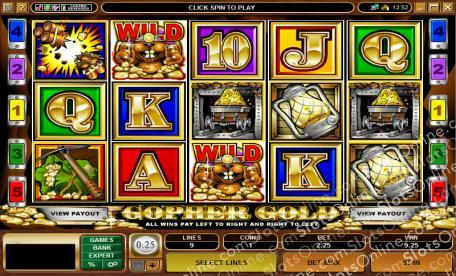 Get down into the mines with Martinez the gopher as you dig up a big gold vein in the Gopher Gold slots. The Gopher Wild symbol is the substitute in this game, and it can substitute for any other symbol to complete a winning combination.